Helping you learn more about the latest product information, tips, tricks, techniques, and customer stories so you can visualize data and communicate results with ease. While less than 1 mile (1.42 km) in length, the Manitou Springs Incline is not for the faint of heart. Originally built for cable cars used to carry materials during the construction of Pikes Peak pipelines, the Incline was a tourist attraction until 1990. Thereafter, the cable cars were disassembled, and soon the Incline grew in popularity as a hiking trail and fitness challenge. The bottom of the Manitou Springs Incline. Approximately 2,744 railroad ties <br />make up the steps to get from this location to the summit. The Incline’s average grade is 41% (68% at its steepest) over a 2,000 foot (610 meter) elevation gain. The trail consists of uneven stairs made with roughly 2,744 railroad ties. The Incline is a mecca for exercise enthusiasts and anyone desiring a challenge. As one of those aforementioned exercise enthusiasts and challenge seekers, I decided to embark on this grand cardio-adventure earlier this year. One early Saturday morning, I joined a few hundred other hikers and began the trek up the Incline, one railroad tie at a time. 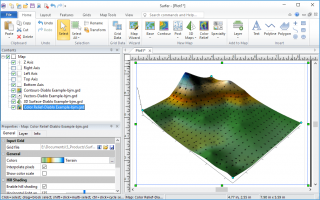 The above 3D surface map was created with our gridding, contouring, and 3D surface mapping software program, Surfer. 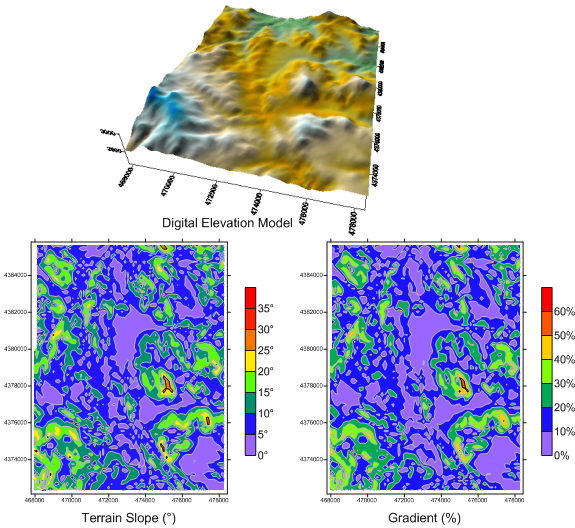 The elevation, imagery, and trail data was downloaded from The National Map courtesy of the USGS. I frequently work out and consider myself to be in pretty good shape, but within the first 5 minutes of hiking, I knew this would be a workout to remember. My heartrate quickly increased and sweat began beading on my forehead. After 20 or so minutes of hiking, my legs screamed for a break. The breaks were quite pleasant as they not only allowed me to catch my breath, they also gave me a chance to take in the spectacular views. I soon developed a system of hiking for 10 minutes followed by a 1-2 minute break, and at that pace, I summited the incline after 1 hour and 2 minutes. The hike back down to Manitou Springs was not nearly as intense as the hike up. While I could have gone back down the Incline, I opted to take the meandering Barr Trail to give my legs a much needed respite. This 3 mile (4.8 km) stretch took another hour and provided additional scenic views. From car to car, the trip took around 3 hours. 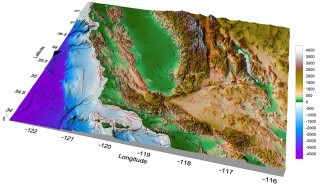 The above map was created with a base map, contour map, and profile map. 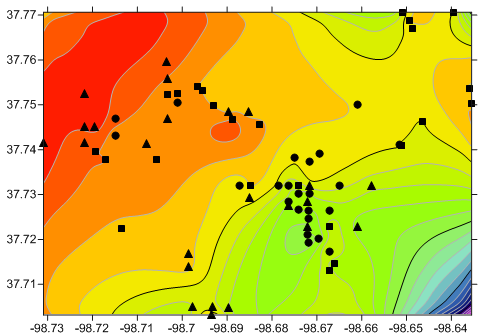 It was plotted with our gridding, contouring, and 3D surface mapping software program, Surfer. The elevation, imagery, and trail data was downloaded from The National Map courtesy of the USGS. I highly recommend conquering the Incline at least once in your lifetime. 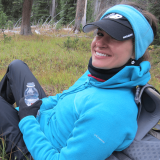 Fellow hikers are extremely friendly and encouraging, and the sense of accomplishment upon summiting is quite a rush. Plus, the post-hike brew never tasted so good! My next challenge will be summiting the Incline’s neighbor, Pike’s Peak, a popular Colorado 14er. Happy hiking! Golden Software is in a class all its own. Your software is outstanding, but what I really appreciate is when I have a problem, in a matter of minutes, I can get a friendly, live, competent technician on the phone. Who else offers that service in this day and age? Golden Software support is the reason that I purchased your products. I occasionally have the need to contact the technical support group and have always found them to be very helpful. That level of support is unusual and I appreciate it greatly! When I first heard of your software from my friend, it was described in near mythical terms. It wasn't until I started using it that the description revealed itself to be apt. The use of these products will no doubt increase the quality and clarity of my research results. Copyright © 2019 Golden Software, LLC. All rights reserved.